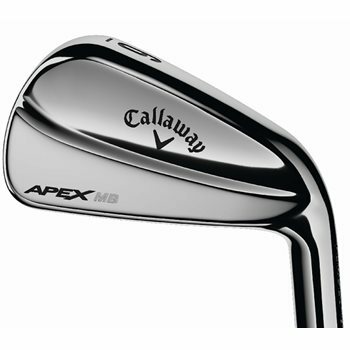 The Callaway Apex MB irons were created with the help of extensive feedback from the world’s best players. These true muscleback irons have a classic shape and style, with a traditional, slightly thinner topline and advanced CG positioning for outstanding control. High performance 20V grooves are built in to promote the high level of control and consistent spin that muscleback players expect out of any playing conditions. The 20V grooves also stand out for reducing fliers from the rough to deliver even more control. The Apex MB irons are forged from 1025 carbon steel for a remarkably soft feel that Tour players want and feature a beautiful bright chrome finish in Callaway’s smallest blade head shape.